Life lessons from God arrive in many different ways. While we work, play, rest-even sleep-God is there, sharing with us wisdom, encouragement, comfort, strength, and peace. From authors Ruth McHaney Danner and Cristine Bolley comes this collection of meditations that quilters-both novices and long-time enthusiasts-will enjoy. Readers will see that valuable lessons can be learned around the quilting frame as we search for and recognize God there. Also includes: The Template-a Bible verse that supports each meditation. The Binding Stitch-a prayer. The Scrap Bag-a quilting tip. - Publisher From authors Ruth McHaney Danner and Cristine Bolley comes this collection of meditations that quilters, both novices and long-time enthusiasts, will enjoy. Readers will see that valuable lessons can be learned around the quilting frame as we search for and recognize God there. 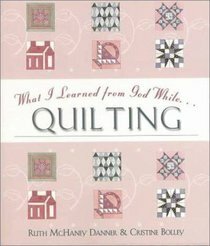 About "What I Learned From God While Quilting"
Ruth McHaney Danner, of Washington state, is a freelance writer who also teaches quilting techniques in various settings.